11 Feb 2017, 3:26 p.m. 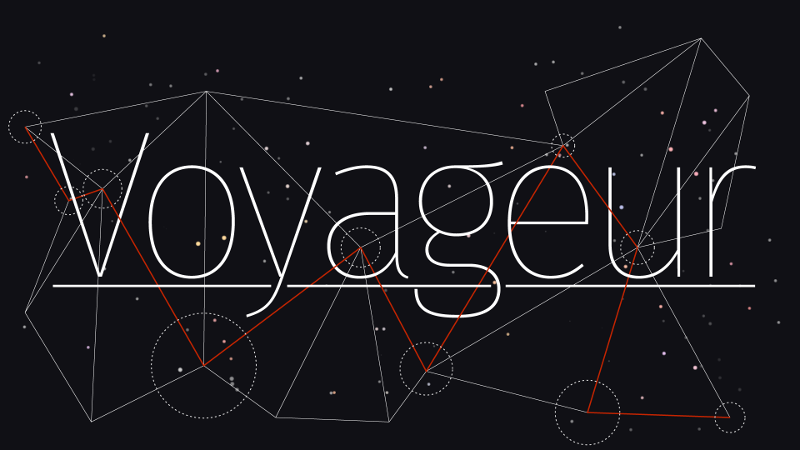 I just bought and played Voyageur, a science fiction story game for mobile. It's one of the games supported through Failbetter's Fundbetter programme, and since I'm mildly obsessed with Sunless Sea, I thought I'd give it a try. I was largely disappointed, though. I won't bore you with explaining how my own unreleased SF story game would be totally superior. You've read it here before, and comparing a real and finished game with a set of ideas is hardly fair. Instead, let's dig into what makes Voyageur unsatisfying. The basic premise is that you are the captain of a spaceship equipped with a "descent device", a powerful FTL drive that is only able to move towards systems closer to the galaxy's core. This is an elegant simplification, because it means you can never revisit ports. 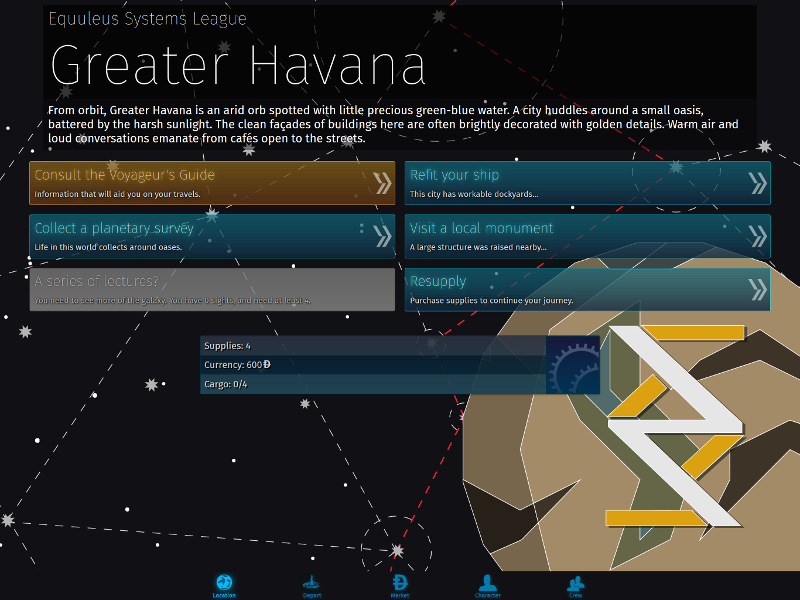 The game only needs to track the state of you and your ship, and not of individual places. So you travel from one inhabited planet to the next, exploring, experiencing, trading, avoiding pirates, upgrading your ship and collecting crew. That should be pretty great, right? It could be, but the game very quickly turns repetitive. There are a few types of planet - the high tech one, the agricultural one, the waterworld, the fungus world - which are fairly interchangeable. The events come from what appears to be a very small pool. Most don't involve any choice on part of the player and simply increase some stat - you've learned a bit more about mysterious alien signals, or you picked up some samples of the local wildlife. Much of the game is randomly generated, or procedurally generated to use the fancier term, but this generation is fairly shallow. Ship upgrades and crew are also minimal: there are two additions you can make to your ship, and about four types of crew member to pick up. There are no trade-offs involved, and the costs are not that high. 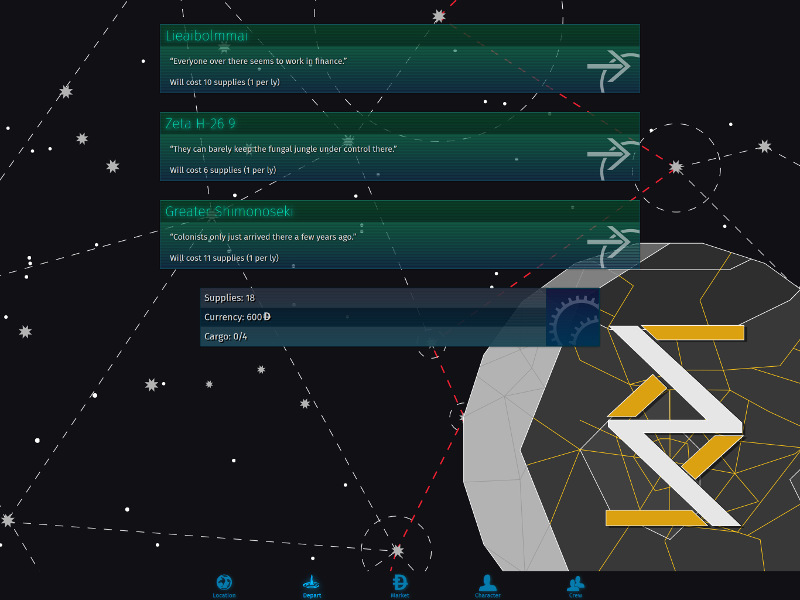 The game states that your crew can react to your actions, and this is true, but there is no way of knowing how they will react, nor a clear consequence of someone being upset. Voyageur wants to be the kind of game that has hidden depths and lore and encourages multiple play-throughs. But there just isn't enough of it for that to be appealing. My first play-through lasted maybe three hours, and I felt that I had pretty much seen all the game had to offer by the end. Yes, there are other endings to the game I haven't explored, but everything leading up to that would be just more of the same. For this kind of game to work, there needs to be a carefully calibrated rate of new stuff to pull the player along. To make this happen, there need to be events in a number of rarity classes. First, the player experiences the bread-and-butter content, the really common events that happen all the time and make up the core of the gameplay. Then there's less frequent events that pop up every once in a while to keep the game fresh once the player has understood the basics. Then there's rare events, so rare that a single new one pops up perhaps once or twice a play-through, to keep the player tantalized and willing to look for more. And finally, there's the almost hidden super-rare stuff, the things that you will only find if you play the game a lot, the reward for the obsessives. Voyageur appears to consist almost entirely of bread-and-butter content with a few less frequent ones thrown in and a bunch of endings. Perhaps there is a wealth of stuff to discover that I have missed, but if so, the frequencies are way off: when absolutely nothing new happens in hour three of the game, there is no way to tell if I've gone through all the game can offer, or if I should just put in another ten hours in the hope of finding some new morsel to keep me entertained. The game itself is sound, the setting and the writing interesting, the core mechanics promising. What it desperately needed was a few weeks of the creator locking himself into a room and just filling in those events that would keep players coming back.